Precast concrete is a construction product, made by casting concrete in a reusable mold or "form", which is then cured in a controlled environment and transported to the construction site for installation. There are different types of precast concrete forming systems for architectural applications, which differ in size, function, and price. Usage of precast elements eliminates or highly reduces the need for conventional formworks and props. They also lower the generation of wastage and checks other environmental hazards. They further provide a safe working platform to the workers. Precast products are manufactured in a casting area where critical factors such as temperature, mix design, and stripping time can be closely checked and controlled, which ensures that the quality of precast products is better than that of cast-in-situ concrete. Moreover, it saves a considerable sum of money through eliminating rectification work. Furthermore, due to factory-controlled environment, different combinations of colors and textures can be applied easily to the architectural or structural pieces. A vast range of sizes and shapes of precast components can be produced, providing flexibility and fresh look to the structures. These are the advantages of using precast concrete. Precast concrete is primarily used in the construction of buildings with repetitive designs and elements, such as schools and apartments. It provides architects with an exciting medium while designing facades for a wide range of buildings, such as healthcare facilities, shopping malls, commercial buildings, and stadiums. Rise in investment in the building & construction industry owing to various government-supported welfare housing schemes has boosted the demand for precast concrete during recent times. In addition, factors such as increasing disposable income, coupled with rising purchase of house, have propelled the demand for precast concrete. Furthermore, rebuilding, refurbishing, and renovation of old buildings have boosted investments in the building & construction industry, thereby augmenting the demand for precast concrete. Low interest rates in housing has also led to investments in the building & construction industry, thus propelling the demand for precast concrete. Precast concrete is manufactured in plants under strictly controlled conditions, which leads to excellent resource efficiency for materials, labor, energy, and processes. Most precast concrete facilities are clean and productive, with computer-controlled processes for batching, mixing, and casting. Efficiency programs are also helping in reducing the consumption of energy in the plant. Precast concrete construction helps in saving time and in reducing the risk of delay or monetary loss in the project. Furthermore, the production process remains unaffected by weather conditions due to the controlled environment of the casting area. Also, usage of large precast panels reduces the time taken to complete structural works. Precast products are manufactured in a casting area where crucial factors such as temperature and mix designs are checked and controlled. By doing so, a substantial amount of money is saved. Moreover, due to factory-controlled prefabrication environment, different combinations of colors and textures can be applied easily to the architectural or structural pieces. A vast range of sizes and shapes of precast components can be produced, providing flexibility and fresh looks to the structures. Precast construction lessens the problem of site wastages and related environmental hazards. It also provides a safe working platform to the workers. Expenditure on workers and materials can also be reduced. Using just-in-time principles, the precast elements are kept at the factory yard until the site is ready for installation. Prestressed precast concrete components have high structural strength and rigidity, which are essential for supporting heavy loads. This allows shallow construction depth and long span in structural components. Fewer supporting columns or walls result in larger floor space, which enables flexibility in interior designing. Dense precast and prestressed concrete components are cast-in with smooth steel, concrete, or fiberglass. This result in components with smooth surfaces which resist moisture penetration, fungus, and corrosion. However, high initial costs for small-scale projects when compared to conventional methods and transportation of precast units to distant places are anticipated to hinder the growth of the precast concrete market. 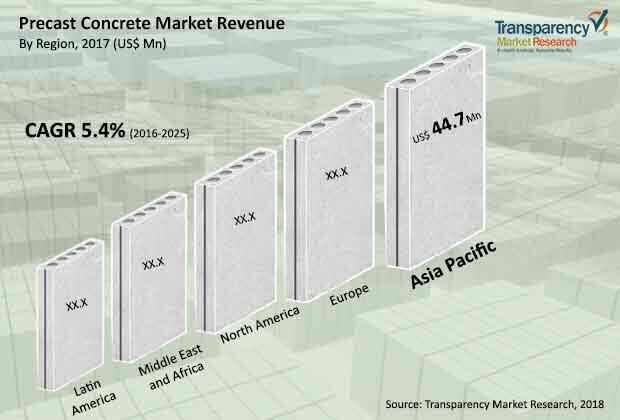 In terms of revenue, Asia Pacific leads the precast concrete market owing to rise in investment in the building & construction industry, which can be ascribed to the surge in industrialization and urbanization in the emerging economies in the region such as China, India, and Japan. Factors such as government-supported welfare housing schemes have also increased the demand for precast concrete. Furthermore, upsurge in activities such as rebuilding, refurbishing, and renovation of old buildings has augmented investments in the building & construction industry, thereby fuelling the demand for precast concrete in the region. Asia Pacific is followed by Europe, in terms of value, owing to the presence of a well-established industrial base in the region, which continuously requires investment. Key players operating in the precast concrete market include Lafarge Holcim Limited, China National Building Material Company Limited, Elematic Oyj, Cemex S.A.B. De C.V., CRH Plc., L&T Construction, Taisei Corporation, Coltman Precast Concrete Limited, Bison Manufacturing Limited, and Weckenmann Anlagentechnik GmbH & Co. KG. Cost leadership, asset light approach, commercial transformation, investing in research & development, and focus on sustainability are some of the major strategies followed by these players.